Do small developing economies, or SDEs, need a specific competition policy to create competitive markets? Against the backdrop of globalization, protectionist policies that promote state ownership and heavy regulation of key industries are proving increasingly ineffective for driving growth. Countries around the world are instituting reforms to promote competition and business creation, yet the economic and political concentration of power, feeble judicial systems, and the scarcity of human and financial resources pose special challenges to SDEs. 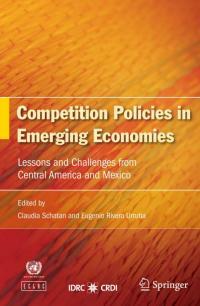 Competition Policies in Emerging Economies features in-depth analysis of two strategic industries — telecommunications and banking — in several Central American nations, to shed light on the dynamics of the transition to deregulation and trade liberalization. Examining the lessons learned from these experiences and featuring discussion of political, legal, economic, financial, cultural, and organizational issues, the book provides unique perspectives on competition policy and economic development The book is primarily intended for decision-makers and policy analysts in international trade and economics, and will also appeal to researchers, academics, students, and professionals in institutional and development economics, international trade, and international affairs. Claudia Schatan is Chief of International Trade and Industry at the Economic Commission for Latin America and the Caribbean (ECLAC), in Mexico City, Mexico. Eugenio Rivera is an adviser with the Public Works Commission of Chile and consultant to the Regulating Authority of Public Services (ARESEP), in Costa Rica. IDRC is helping to ensure that voices of Southern researchers will be prominent. IDRC and partners will fund action-oriented research on developing skills and mentorships among Africa’s youth. Former UN Secretary-General Kofi Annan passed away on August 18, 2018. What does the economic future look like for young Ivorians? View moreWhat does the economic future look like for young Ivorians?